Fairytales. I love them. Why wouldn’t you love a place where if you somehow fit yourself into a rabbit hole, you end up in a new world or where it doesn’t matter if you die because some charming bloke might come along, give you a kiss and hey presto, you’re alive and now have a perfect boyfriend? Needless to say, I’ve always loved a good disney movie or magical tale where good (almost always) triumphs and everyone is happy happy happy. There is, however, something I love even more – and that is modern adaptations and the retelling of fairytales. You recognise some of the elements, but only as a background thought because you truly have no idea how it’s going to end. Ok, so those films like Snow White and the Huntsman or Maleficent and the like are pretty standard in their adaptations, in the sense that you still know the characters and pretty much what’s going to happen. However, there are very few books that can do a fairytale retelling and make you forget that that’s what it is. 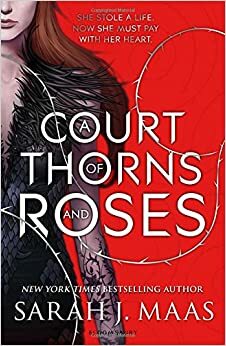 Ladies and gentlemen, I present to you A Court of Thorns and Roses. Written by the brilliant Sarah J. Maas, known for her fantastic Throne of Glass series, this retelling of Beauty and the Beast is fantastically brilliant. My favourite books that include faeries, or ‘The Fae’, still remain as the Iron King series by Julie Kagawa, most likely due to the fact that they were among the first I read so I have some nostalgia for them. Sarah J. Maas, however, has definitely claimed her place among my favourite reads, let alone favourite Fae reads. She has a perfect blend of fantasy and magic with action, adventure with that sprinkle of romance to whisk you away to another world. Her writing style is just beautiful with exquisite detail that maintains this fast pace into this new world. She builds up each scene until you’re flipping through the pages at the speed of light, devouring every word. Feyre is a great lead character but clearly has a lot of room for development for the next books in the trilogy. Her circumstances force her to be a Katniss-like figure, hunting in the dangerous woods and providing for her family where there are other fairytale elements – for example, her two sisters almost act like the typical ‘evil stepsisters’ but in a much more realistic way. Instead of just insults and jeers, there is a complex background and history to their family relationships which only brings the story to life. As said in the blurb, Feyre (I think it’s pronounced Fay-rah, but I’ll get back to you on that one) is taken to magical, yet sinister, Fae realm/territory and her captor’s face is covered by a strange mask. From here, you delve into a strange mystery with new plot twists at every chapter. Maas adds elements to the story like logs to a fire, so where you started with a small flame you’re left with a raging bonfire as the tale builds and builds. I read this book in one sitting, unsurprisingly, and would definitely recommend to anyone interested in fantasy and mystery. It transforms any notions of faeries being small and sparkly people with wings and fairy dust into these terrifying, ruthless monsters that use trickery to cause pain for their viewing pleasure. A brilliant read and an easy five stars from me. Every now and then you come across a book that reminds you why it is that you adore reading. A few of my friends had recommended The Night Circus so I’d bought it, yet it remained on my ‘To Be Read’ shelf for quite a while. I picked it up just before exams and so read the first few chapters before having to put it down again, leaving the rest as a post-exam reward. Honestly, I had no idea what I was expecting when I started this book – all I knew was that it was a circus that travelled around the world, open only at night. Personally, I think that was possibly the best way to approach this masterpiece of a book. This blurb perfectly prepares you for the fantastical world you’re about to discover, filled with mystery and intrigue. If I had to sum this book up with one word, it would be ‘enchanting’. I’m wary of saying anything more about the actual plot of the novel, as really it’s about discovering for yourself and trying to figure out what on earth is going on as you read. I think my favourite thing about this book is the world that Erin creates. When I do my own writing, I often struggle to add enough detail about a particular scene and gloss over minor details – clearly, this is not something Erin Morgenstern does. Every setting is filled with enough description to help you visualise such a wondrous place, yet not so much that it deters you from reading more. I think it’s a combination of the imaginative scenes, the wonderful characters and that constant element of mystery which allow this book to be such a masterpiece. I would recommend this book to anyone, and especially if you’re interested in a little bit of magic or fantasy. I know that I’ve barely said anything about this book other than how great it is, but that’s because I don’t want to ruin it for other readers! 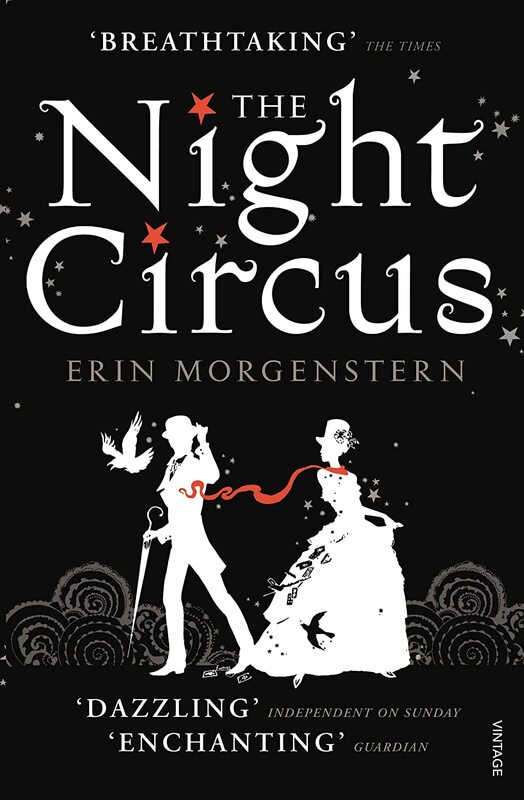 With something like The Night Circus, you just need to go pick it up and read it to see for yourself, then shove it in everyone’s face and scream, ‘You must read this book!’. So, Miss Morgenstern, I bestow upon you five glimmering, fantastical stars – and also a request that this is made into a movie. Please. Hi everyone and welcome to Always Love to Read….a Lot. If you want to know a bit about me, visit the ‘About El’ page or drop a comment below if there’s a question burning on your mind, such as ‘What is your favourite flavour of Ben &Jerry’s Ice cream?’. (The answer is Caramel Chew Chew, of course). This blog is the product of another, my original site alwayslovetowrite which was a place where, obviously, I wanted to write. With writing comes reading, and as alwayslovetowrite has become a sort of online diary, I decided I needed a different place to geek out about books. Which brings us to now. 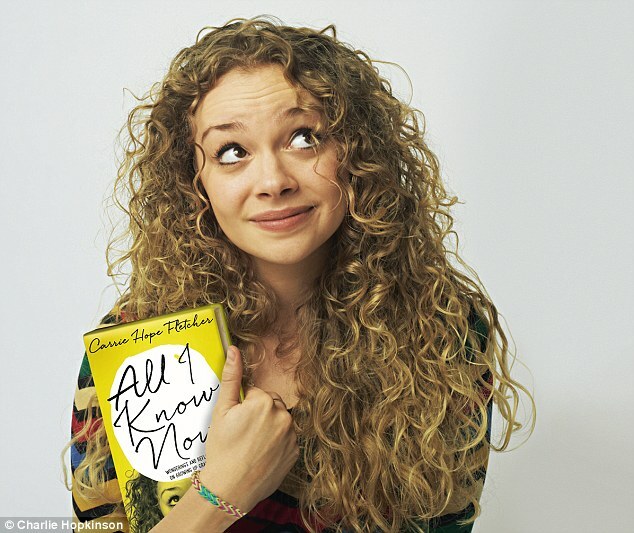 So to kick this off, I’d like to start with a book that released last month and is already the Sunday Times #1 best seller: All I Know Now by Carrie Hope Fletcher. Carrie is known for being a YouTube sensation, singer, songwriter, actress, Eponine in Les Mis in London and now an author. I personally first discovered Carrie on YouTube, and then I was hooked by the bubbly personality which always helped to brighten my day. I’m unashamed that at eighteen-going-on-nineteen, having Carrie as a role model helped me to keep strong on days when I wanted to give up. I, like everyone else, wanted to be her best friend, to hear all her stories and soak up all her advice. Now, with All I Know Now, that’s possible. We all know that growing up is hard to do, and sometimes the only thing that makes it better are the reassuring words of someone who has walked that bumpy road just a few steps ahead of you and somehow ended up as a fully-functioning adult. Carrie Hope Fletcher is that person. Thanks to her phenomenally popular YouTube videos, Carrie has become an ‘honorary big sister’ to hundreds of thousands of young people who turn to her for advice, friendship and, most of all, the knowledge that things will get better. 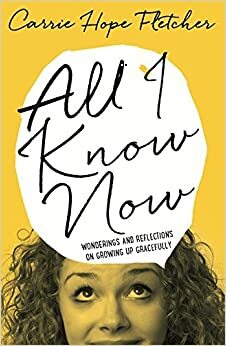 Carrie has created a safe and positive space for young people to connect and share their hopes and concerns online, and now she will share her most personal thoughts and experiences in her first book, ALL I KNOW NOW. It includes Carrie’s thoughts on some of the topics she’s asked about most regularly: bullying, body image, relationships and perhaps the scariest question of all: what does the future hold for me? With warmth, wit and a sprinkling of hard-won wisdom, Carrie will provide the essential tools for growing up gracefully . . . most of the time. My only negative about this book is that it wasn’t published sooner. Andrew Kaufman’s comment that this is a ‘best friend in book form’ is spot on. As you read, Carrie’s voice shines through in every word and will have you laughing with her, crying for her and loving every second. I want to tell girls younger than me to go out and grab this book, read every word and carry it with you whenever you need some advice. It’s easy enough to hear someone tell you that they’ve been through what you have, but to read about it in a raw, nothing held back prose. There are so many times through secondary school when I couldn’t help but wonder ‘am I the only one’ and want to go to bed, pull my duvet over my head and hide from the world. To read Carrie’s experiences and find some so like my own – and others completely not – it helped to see my own from a different perspective. It’s of course easy to say now that I would have done differently, but I’d like to think that if I had read Carrie’s book when I needed it, maybe i would have been able to deal with my problems more easily. Hell, there were even chapters on how to apologise that I approached thinking ‘I know this’, but when I finished I realised that there’s a lot I still don’t know. Sure, if you’re a girl or boy in school then I’d recommend this book with all my heart and if you’re not in school, then I’d recommend this book anyway. It doesn’t matter how old you are – anyone can read this book and end up with a smile on your face. After seeing Carrie’s journey through YouTube, famously achieving her childhood dream of becoming Eponine in the West End, she was already inspiring. The awe only increased when one of my best friends took me to see her last week in Les Miserables and then to briefly meet her at her book signing (both of which were incredible). But often when you have these public figures, you forget that they were once young kids and teenagers who dealt with bullies just like you. This book is more than just a few pages bound together – it’s a place to turn to when you’re feeling down, when you need advice or even when you just want a bit of a giggle. Thank you Carrie – I hope to read more from you soon. You’ve got five, big, fat, shining stars. That’s all from me today. Thanks for reading and, if you so wish, leave a comment, a favourite or even subscribe – there’s more books to come.